Six Flags Fiesta Texas is definetly one of the more interesting Six Flags Parks. It's easily a personal favorite of mine within the Six Flags chain. Yes, Six Flags Fiesta Texas has some great roller coasters within the park, ranging from a really great B&M Floorless Coaster, to a Premier Spaghetti Bowl, to a really cool RMC, that like all the others, is a fantastic ride. Yeah, Iron Rattler is f*cking amazing, and I'll go over all that in my review. But this park just has a TREMENDOUS amount of balance. I've already discussed all the great coasters right above, and if you want more details, I have individual reviews for each of these coasters. 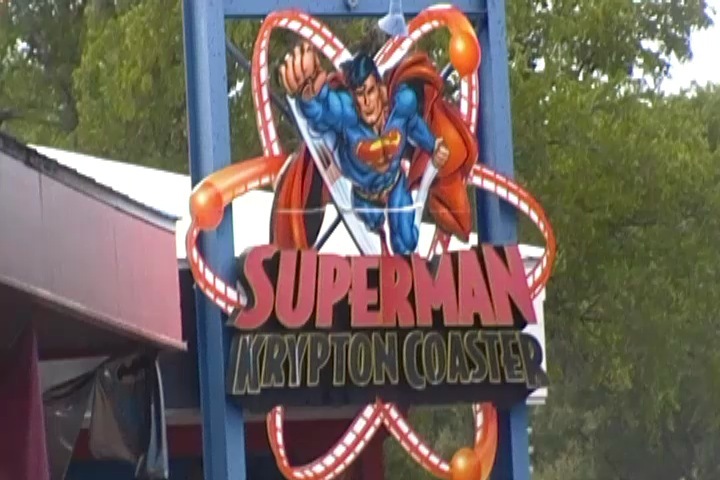 But even outside the coasters, Six Flags Fiesta Texas just has a ton of other cool rides. It is one of the few Six Flags parks that actually has a really great flat ride collection. The water rides should do a good job considering how freaking hot Texas can get in the summer, and Six Flags Fiesta Texas is one of the few parks in the country that has a freaking dark ride. Yeah. A Dark Ride in a Six Flags park. Well, nowadays, they're adding them, but at the time, that was freaking impressive. And it's just really well run, with a great atmosphere. It's one of the biggest parks in not only San Antonio, but also all of Texas. So yeah. Be sure to check it out when in the area. There is a link to a review of all the Rollercoasters at Six Flags Fiesta Texas. Please keep in mind that there is no review of Batman the Ride or Wonder Woman Golden Lasso Coaster because neither of them existed when I last visited. 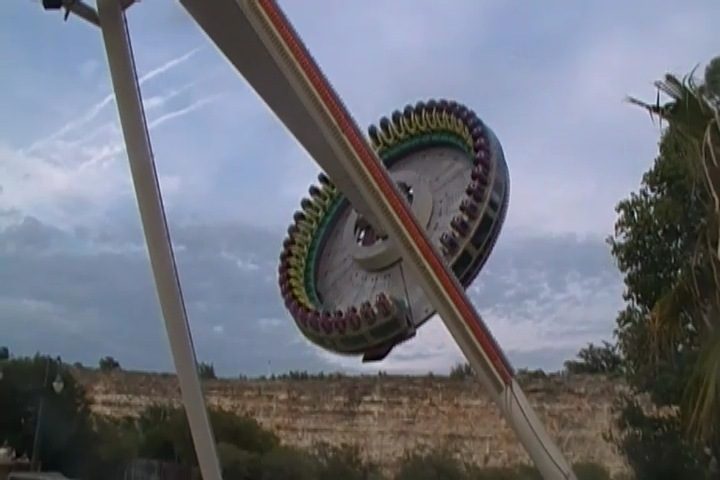 Here are the reviews of all the Flat Rides at Six Flags Fiesta Texas. Now while Six Flags Fiesta Texas does have a decent flat ride collection, especially for a Six Flags Park, I only ended up riding one of the flat rides in the park. And sadly, that flat ride has since been demolished. Their Frisbee. Now this shouldn't be a big deal. But not only do I really like Frisbees, but this was a really AMAZING frisbee. It not only spun a lot, but it swing like CRAZY!!! It's a shame that this ride got demolished because it was a lot of fun. As for the other flat rides in the park, they have a Star Flyer, which seems to be of a decent height. It looks like fun. They also have an S&S Combo Tower, that while I didn't ride, I heard a lot of good things about it. And I do know from other parks that the Combo Towers are a lot of fun. And those are pretty much the good flat rides. They also have a Top Spin, a tilt a whirl, a scrambler, some chairswings, bumper cars, a carousel, and a tiny ferris wheel. What? A Dark Ride in a Six Flags Park!!? Yep, despite your disbelief, Six Flags Fiesta Texas has a dark ride, and it's one of the older dark ride. They had a legit dark ride back before it was cool for the Six Flags parks to have dark rides. Yeah, I'm talking about you Justice League dark rides. It's called Scooby Doo's Ghostblasters. And yeah. It's your typical shooting dark ride. Which is always fun. You join up with Scooby and the gang, go into the haunted house, defeat the ghosts, take off the mask, *gasp* "OLD MAN JENKINS!!? ", all that good stuff. And on top of that, it's a great way to beat the insanely hot Texas heat. Definetly check it out. Yeah. 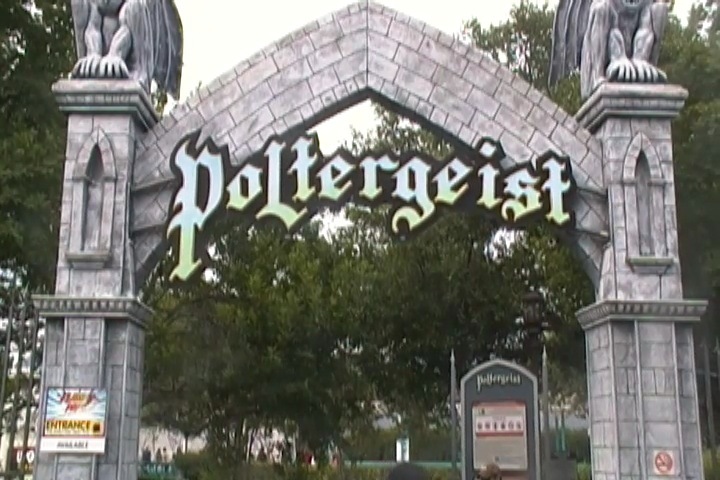 This was a really fun dark ride. Now I may not have ridden any of the water rides at Six Flags Fiesta Texas. Though they certainly seem interesting after taking a look at them. First up, their log flume. Now, this log flume doesn't look that good except for one little thing. It has some theming. And it's themed to Bugs Bunny fighting a sea serpent. I like that. That should make the ride more fun. They also have a rapids ride that seems to be fairly isolated from the rest of the park, sort of like how Roaring Rapids is isolated from the rest of Six Flags Magic Mountain (I know it's not, but it certainly feels like it at P2). And then there's their shoot the chutes ride. It's just a typical ordinary shoot the chutes. I didn't ride any of these rides, but they certainly look fun. And considering how hot Texas can get in the summer, I'm sure that these are all popular rides. Yep, Six Flags Fiesta Texas does indeed have a water park, and no. I did not visit. On the one hand, I keep hearing good things about this water park, how it's a lot of fun, and it is included in park admission. So it's not like you'll be losing a ton of time or risk losing money by going here. But on the other hand, you can just go to Schlitterbahn, which is one of the best water parks ever, and only 20 minutes away. Like most parks in the Six Flags chain, Six Flags Fiesta Texas has nothing spectacular when it comes to its dining options. We didn't eat anything when we visited the park. We literally just ate the left over Panda Express from last night. Yeah, that's not ideal, but from what I can imagine, the food in the park is just your typical Six Flags food. There is a mall nearby that has some dining options. But yeah. Looking at the dining options online, it seems better than usual Six Flags as they do have some other options, such as Mexican Food and Asian Food, but I'm predicting it's the kind you'd find at a mall. But hey. I'll just have to check it out for myself. Here are the reviews of all the other stuff at Six Flags Fiesta Texas. Now while there's no actual theming within the park, they do have a great setting right off the edge of the quarry. Honestly, this is by far the best setting in any Six Flags park (well, except for La Ronde, and you know that I'm not a fan of that park). It just looks absolutely beautiful. It's just a great place to have the park. As for other stuff to do, I may not have done much else, but I've actually heard some good things about the shows here. Apparently, Six Flags Fiesta Texas is the one Six Flags park that actually has really good shows. I'm not sure what they are, but it's the only Six Flags park where shows get talked about. And not by the park for advertising, but people actually go out and discuss them. So while Six Flags Fiesta Texas may not be dripping in other stuff to do like Disney parks, Universal Parks, or just European Parks in general, they do have a lot of cool stuff. *Are there kiddy coaster restrictions? - Nope. You can ride Kiddee Coaster. *Get in line for the Scooby Doo dark ride early. It gets long lines (Or just get the Fast Pass). *The line for Iron Rattler isn't as bad as it looks.